Joined at The Boston Foundation by more than 100 colleagues, supporters, and social sector leaders representing 70 different organizations, we had the opportunity to discuss Looming Challenges and Promising Opportunities in Boston’s Social Sector - what they are, why we all need to come together to address them, and how our model will support that effort. You agree that talent development is a big challenge - and you’re ready to tackle it. As we embark to build this movement, it’s important to always listen and learn, and to remain nimble, humble, and idealistic. It’s crucial to bring together students from diverse backgrounds, communities, and disciplines in order to build a talent pipeline that will push for innovative and collaborative approaches to society’s greatest challenges. We must be a partner and a leader. The social sector is growing faster than any other part of the US economy. With this growth comes the opportunity to create meaningful and lasting change in our communities and at scale. However, the social sector currently lacks the infrastructure and resources needed to match this growth, particularly related to finding skilled, knowledgeable talent for staff roles at all levels. As society increasingly turns to nonprofit organizations, in particular, to address problems, it’s crucial to focus on developing talent to lead in creating meaningful impact in and serving our communities. 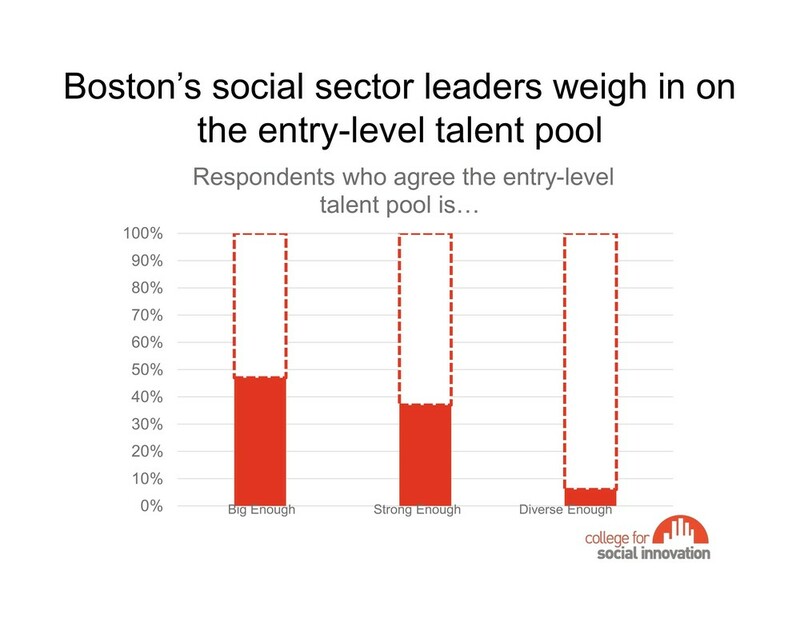 Right now, we don’t have the talent pipeline to achieve our goals: nonprofit leaders we surveyed overwhelmingly agreed that the current talent pool is not big enough, strong enough, or diverse enough to best serve our missions. College for Social Innovation aims to build a bigger, better, and more diverse talent pipeline for social change. Our model provides opportunities for college students to earn a semester or more of credit for well-supported fellowships in the social sector. We’re starting by partnering with leading colleges to place students in semester-long, full-time, full-credit Social Innovation Fellowships with social sector leaders in the Boston area. Students will learn through job-related assignments and relevant seminars and reflection activities, all of which will help them build career-based competencies and a network. Over time we will scale College for Social Innovation to additional cities and enroll thousands of students, helping to inspire and train a new generation of problem solvers. We are excited to carry forward the momentum of this event and build an incredible program this fall for our Fellows, Host Organizations, and College Partners alike. Hungry for more information about building the social sector talent pipeline? Read about our program here!